Pre-order WHEN THE NIGHT COMES DOWN! Pre-order the new horror/dark fantasy anthology When the Night Comes Down from Dark Arts Books today! Featuring 16 short stories by Joseph D’Lacey, Bev Vincent, Robert E. Weinberg and Nate Kenyon, this amazing collection will debut at the 2010 World Horror Convention in Brighton, England at the end of March. The book is at press now, and will be shipping in about three weeks. Order a copy today and you’ll be one of the first to receive the dark magic of When The Night Comes Down. See the full description and table of contents here. Stoker Nomination and Stellar Review! A Stoker nomination and great review were in the news for Dark Arts Books this week. First off, a hearty congratulations to Mort Castle, whose excellent story “Dreaming Robot Monster” from MIGHTY UNCLEAN received a nomination for a Bram Stoker Award in the Long Fiction category! Also, there is another fantastic review of MIGHTY UNCLEAN up at Dark Discoveries. They say a bunch of awfully nice things about each authors’ work, and finish up with “…a great collection and highly recommended.” You can order MIGHTY UNCLEAN right now in the Dark Arts Books online store. We are busy at work making sure everything is set for the launch of our newest title WHEN THE NIGHT COMES DOWN, at the World Horror Convention in Brighton, UK next month. 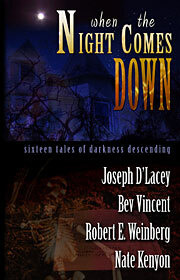 WHEN THE NIGHT COMES DOWN features sixteen awesome tales from Joseph D’Lacey, Bev Vincent, Robert Weinberg and Nate Kenyon. Pre-ordering information will be available soon. Best to everyone and look forward to seeing you in Brighton!